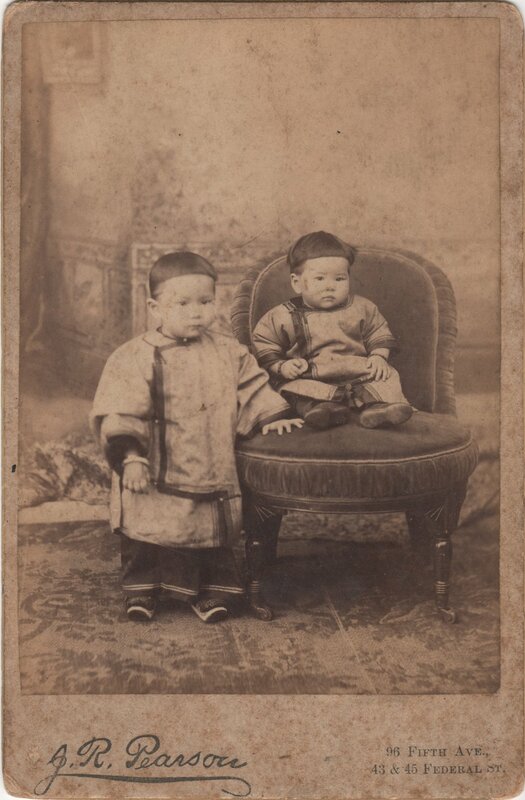 Here is a very unique late 1880s cabinet card photograph of two young children, presumably of asian descent. My first guess is Japanese, but it could be Chinese or even something else. The photographer is identified as J.R. Pearson at 96th Fifth Ave and 43 and 45 Federal St. The back of the photo gives the cities as Pittsburgh and Allegheny City, Pennsylvania. The names written on the back are "Berth and Lillie James" with the date of 1888. It is hard to know when these names were written and how accurate they are. I obtained the photo from eBay. I did a quick search on ancestry.com and newspapers.com for various combinations and permutations of Bertha and Lillie James of nearby cities in Pennsylvania. There were dozens to hundreds of results, given the relatively common first and surnames involved. Plus, I sincerely doubt the birth names of these young girls were "Bertha" and "Lillie". That is a complicating variable in this mystery. I would love if you could help me tell their story! Let me know what you find. Were Bertha and Lillie sisters? Are these their birth names? What presumably traditional garb are they wearing? What was the Asian immigrant experience in 1880s Pennsylvania? What do you think, feel, and wonder about as you look at this photo.